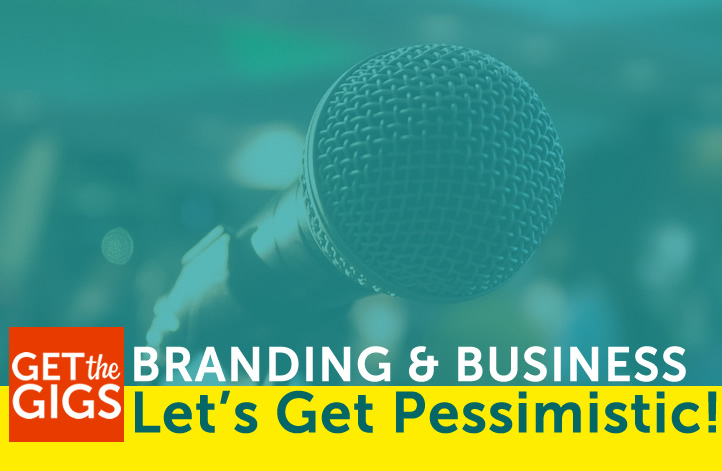 Branding & Business: Let’s Get Pessimistic! It requires boundless optimism to be an entrepreneur, almost to the point of being self-delusional. No one is disputing how important optimism is when branding and running a business. And no one is suggesting that moping or falling into a self-destructive funk is smart business. Okay? Have you ever considered looking at your personal brand through pessimistic glasses? It could do you a lot of good. Branding issues resolved with the glass “half-full” approach? Since we’ve been old enough to understand the concept, we’ve been taught, “think positive and good things will happen!” While this is true on some level, there’s a benefit to being a pessimist that people rarely talk about. Pessimists go through life better prepared, with thorough plans in place in case of disaster. While an optimist sees only sunny days ahead, the pessimist is prepared for hurricanes, tornados, earthquakes, and the apocalypse. ASSUMED that no one in your target audience will get you and that no one will understand what it is that you do. You would have to make sure that your message is not just clear, but damn clear. ASSUMED that your target audience wants no part of what you sell. You would need to go overboard with a brand with built-in defenses against sales objections and come from a point of persuasiveness. ASSUMED that everyone in your target audience is going to take one look at what you do and hate your guts. You would make sure that your brand positions you as an irrefutable expert in your field, someone who transcends personality conflicts with the ability to straight up solve a problem. ASSUMED that your brand will fall well short of reaching the number of people you need to reach. Well, then, you would just have to make sure that your brand converts at a higher percentage for the people you do connect with. Keep the sunny disposition as you deal with people and as you make plans for the future, but plan as if everything that could possibly go wrong will go wrong. The extra planning will bring you serenity in times of anxiousness. Trust me, this is coming from a compulsive worrier! How does your brand stand up against the worst-case scenario? We’d love to talk about it. Don’t feel like leaving your brand woes for all to see in our comment section? We understand. You can easily schedule a 15 minute complimentary strategy session to discuss and discover how your brand stacks up. https://www.getthegigs.com/wp-content/uploads/2018/06/NEW-brand-pessimism.jpg 471 722 Derek Hart https://www.getthegigs.com/wp-content/uploads/2018/06/GTG-w.png Derek Hart2018-02-15 13:25:582018-06-30 17:35:19Branding & Business: Let's Get Pessimistic!